Hey there. We’ve put together a detailed tutorial below for MapifyLite. Don’t have a copy yet? Grab it: It’s free and pretty darn cool! Set the “Mode” to “Image Mode” at the top of the Map Settings. 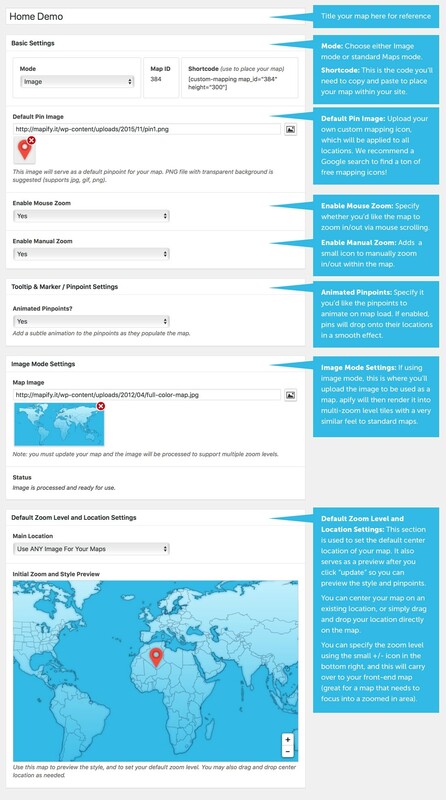 Upload your image in the “Map Image” option. Click “Update, Publish, or Save Draft”. This is a crucial step as it then sends your image to our servers for rendering, and then sends it back to you. You will see a progress status for this process, and it typically takes about 2 minutes (depending on your bandwidth of course). After rendering, you will see the image in the map preview area. Tips for Image mode: We highly recommend using the largest (in width/height, not file size) image you can find. This will result in a better map that can be zoomed in on the details. However, to do this you’ll want to optimize your image to find a balance of clarity and file size. The beauty of this technology is that it will take a very large file (file size) and render it to quickly display. However the larger the file size, the longer it will take to render, so keep that in mind. We recommend keeping the file under 2mb though it can handle much larger files (but will take longer to render). 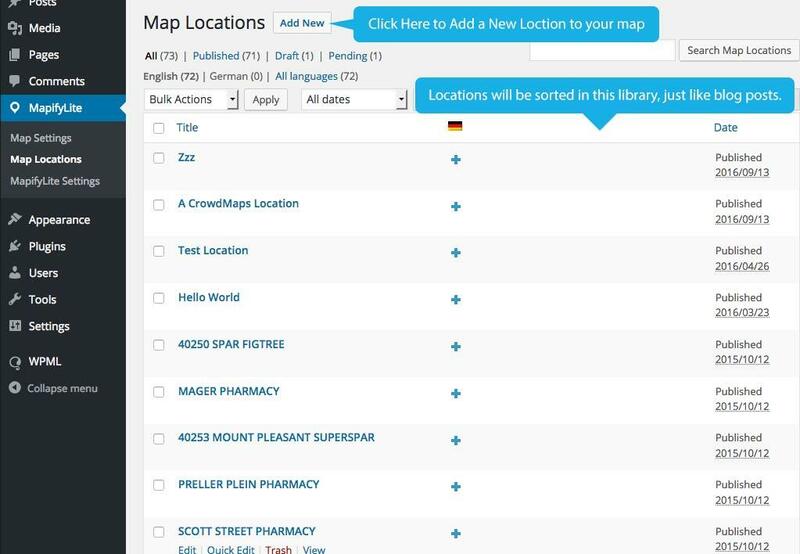 After setting up your map, you can start adding locations! You can add as many locations you need in this tab, and they are setup like pages/posts, so the process will be very familiar to WordPress users. Keep in mind: This shortcode WILL NOT overwrite your theme’s CSS settings. So, if you publish the map on a page that restricts the width to 450px, the map will not force a larger map area based on the shortcode. You’ll have to change the Theme CSS as well if this is the case. That covers the full overview of MapifyLite! 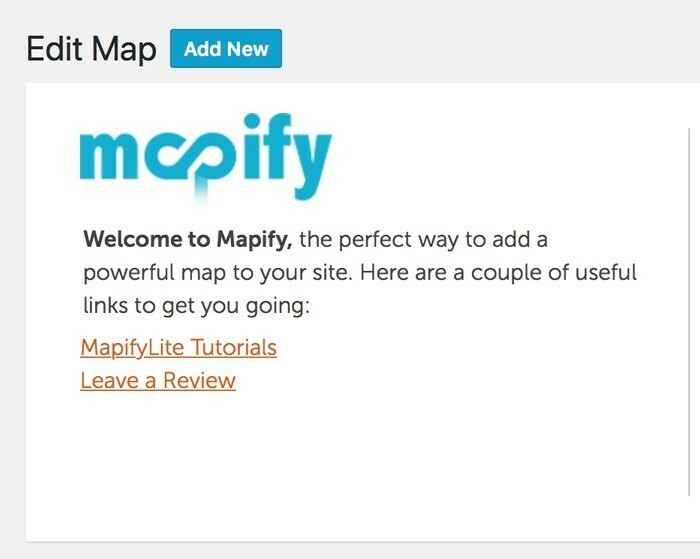 If you need more features, feel free to grab yourself an upgrade with MapifyPro as it is by far the most powerful mapping plugin available for WordPress, and features TONS of additional features. Even better, you can seamlessly upgrade without losing a single setting from MapifyLite.